There are things hard to present in a video, even more with pictures: invisible elements that are jostling me, instant concerns where taking out the camera is the least of my priority, feelings and emotions lived on-the-spot. Southern Mexico have been rich, thrilling, rough. Jealous about the week I had in Puebla where I didn’t really take care of her, my bike called for revenge in the first big downhill back on the road, exploding one of its back wheel’s spoke. It’s the third one of the trip. Moreover, she did it on the cassette side, just to tell me she was vital to my life. I had the tool to take the cassette out to change the spoke, but even though I was putting all my weak cyclist’s arms force into it, I wasn’t able to move anything. Fortunately, a little bike shop in the next village help me to put everything back in order with not much. To go to Oaxaca, I found quiet little back roads zigzagging on mountain’s slopes, sometimes surrounded by long and thin cactuses. A soda delivery truck was stopped on the side of the road, the driver working around it. It was hot. I was hardly going up. One or two kilometers further, I found myself in a plastic bottles spillage. The truck down there lost a lot. My sugar level probably exploded that day, and burping freely in the openness of those dry mountains was quite satisfactory. On the last day to Oaxaca, I wasn’t going along mountain slope anymore, now surfing on mountain tops, offering a bird’s eye view of the surrounding valleys. Small indigenous villages were perched here and there, with curious eyes observing me climbing slowly the hills. Sometimes a bird of prey was flying not too far at my height to then dive in the valley. The downhill to Oaxaca was mouth-watering. I pushed the machine quite hard on this segment and Oaxaca was the perfect place to relax. I discovered a peaceful state capital, with luxuriant green public places, with a noisy central market full of culinary delicacy and with a pedestrian street sweating culture. I am truly in Southern Mexico, going through a transition in the vegetation, in the humidity, in the music heard in the streets and in the look of the people. Goodbye cowboy hat and welcome to lighter clothes and women with traditional indigenous clothing. I was about to join sea level in two days out of Oaxaca, 1.5000 meters lower, but I probably climbed back three times what I was going down. 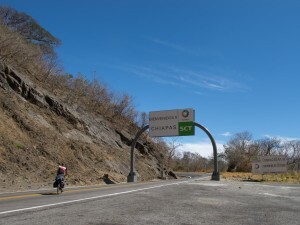 What I could call heat in Oaxaca wasn’t that bad compared to what I felt when I arrived in Tehuantepec isthmus, the thiner land zone of Mexico between the Pacific and the Caribbean Sea. The road was passing 20 kilometers from the ocean, and it didn’t need much to convince myself to do the little detour to Salina Cruz. I was hurtling down the road to the port town center, already dreaming about ditching my feet in the sand and dipping in the ocean when I heard a “crack” coming out of my back wheel. An other broken spoke. I got lucky in my badluck, a bike shop being 200 meters away. 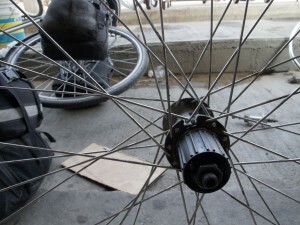 Taking my panniers off my bike, I saw that it wasn’t a spoke problem; the part of the hub holding the spokes simply cracked. The part needed to be changed. The guy from the bike shop didn’t had anything for me and pessimistically referred me to a second bike shop. Walking my bicycle over there, I was nervously making my mind about having to stay here for days to make deliver the part. It could have been a worst place, but I wasn’t pleased at all being stuck here. Such a release to see the bike shop boss arriving and taking out the good hub from under his counter, after explaining, showing and reexplaining the problem to his incompetent employee. “Come back at 2PM and your wheel will be fixed”. “Where’s the road for the beach?”, I happily asked. A north wind was raising while leaving Salina Cruz with my new hub, but this haven’t stopped me from reaching before sunset Juchitán, where a British expat CouchSurfer was waiting for me. Therefore, at one time on the road, I lost control and the wind pushed me from the shoulder. 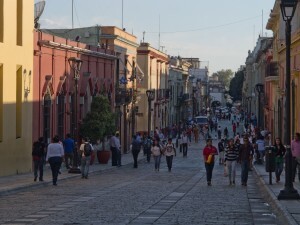 Few tourists stop in Juchitán, except some windy cyclists and curious anthropologists. Tehuantepec isthmus is the land of a matriarchal society contrasting in a quite macho Mexico. Actually, I’ve rarely since such confidence in the eyes of woman and such self-assurance in the walk. Moreover, the muxes, men wearing women’s clothes and role, are playing and important part in the society. Two links to learn more: The Society Pages and Ethnoscope. A WarmShowers host were waiting for me at the end of the day and he wrote me not to hesitate to take a transport close to La Ventosa (The Windy). Out of question for me, and I left Juchitán with a “breeze” in the face. 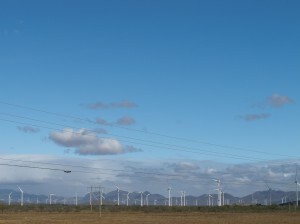 Hundreds of wind turbines were appearing in the distance. 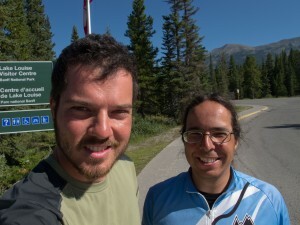 I went across two Québécois on bicycles and while we were exchanging some informations on our respective upcoming roads, Talen, an Estonian, was arriving from my direction. We will be two to share this ordeal. 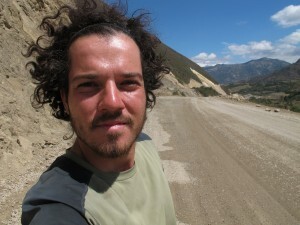 In La Ventosa, the road is turning East, the wind taking us from the side. Three times I felt from the shoulder. Never I felt a wind like that. The wind propelers’ humming was cut by strong slams, wind gusts bringing the balance on a bike a circus act. If we weren’t cycling in a diagonal position, supported on the side by the wind, we had to resign to walk the bike… when a wind gust just got into my panniers, pushing me down the road in a ravine, my bicycle following in three roll over. When I was a kid, on windy days, I was walking back from school jumping as high as I can, hopping that the wind will bring me further. Dream now accomplished. This Caribbean wind, even stronger in January, sets forth in this corridor and tumbles down the mountains to the Pacific. This 40-kilometer stretch of road seemed like eternity. It was an invisible obstacle race, where the animal instinct take over, with the objective of rushing forward to get out of this muck up. 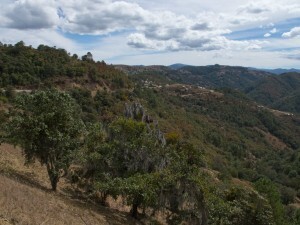 I was quite happy to go back in the mountains the next day, entering in Chiapas state. I was presuming less wind, but more we were going up toward the pass, more the breeze gained strength. 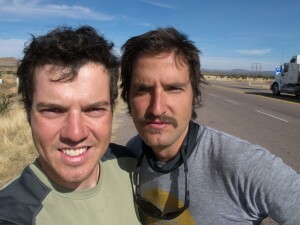 While Talen and I were taking a break on the side of the road, Anita, a German woman, caught us up. We will be three to share this hell. At least, the day before, the road was straight and the wind was coming more or less from the same direction. Here, moreover having the curves and the grade of the road, the wind was hitting the mountains and bouncing back in every directions, like wind’s waves. We were in a sea of air. Sure, the landscape was marvelous, sometimes we could see the ocean far away down there, but fun was short-duration. The mountains’ rocks were sometimes carved to make the road, creating a rocky corridor where the wind was diving into without warning. Two times Anita’s bicycle just lift up and turned over, throwing her on the ground. At each of those corridor, one of us were sacrificing himself, throwing himself into the corridor, hoping to get away without trouble. The other ones were following if positive, or walking the bike if too air-bumpy. We were like mice in the immensity, trying to get out of the air’s labyrinth. Things finally calmed down on the other side of the pass, the animal instinct got quieter and I felt asleep that night still cradled by an imaginary wind. Tuxtla Gutiérrez, Chiapas capital, is quite a commercial town, but the CouchSurfer who hosted me make me discover his daily life for a few days and brought me to Sumidero canyon and Chiapa de Corzo, a little town close by finishing its picturesque feria. Talen threw himself toward Yucatán and I met up with Anita, who left before to San Cristobál de la Casas, in order to enter Guatemala together. The little colonial town hasn’t speak to me like Oaxaca, but the road to get there, an uphill of about 1.500 meters in 50 kilometers, was memorable, overcoming the switchbacks and going through indigenous villages with inhabitants wearing purple tint traditional clothing. The mountains brought us in two days to Ciudad Cuauhtémoc, four kilometers from the border, waiting the next day to cross it. If it was the elements that left a mark on me on those last days, I think it will be the people that will impress me in Guatemala. I thought there were a lot of people in Mexico; there are even more here. My first impressions of this country are strong. I only biked two days before setting up in Quetzaltenango for my first volunteering spot. But all this is part of an upcoming article. This entry was posted in 03. México by CycloExpedition Americas. Bookmark the permalink.